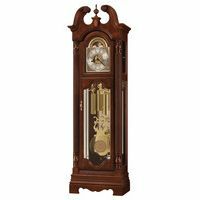 The Hermle Castleton grandfather clock features a handcrafted case made in Virginia, USA! 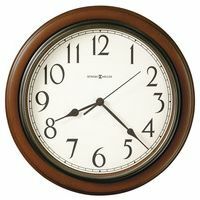 The case is constructed of solid US cherry wood. The movement and clock accessories are made in Germany. Assembled and Inspected in the USA . This finished cabinet has a graceful swan neck pediment with a carved finial and a genuine crotch mahogany veneer crown, hand rubbed, with maple fleur-de-lis inlay and primavera veneer border. Case has half-tuned fluted columns with carved column caps, separated hood and waist front doors, lockable waist door with beveled front and side glass, side access doors and a three-tiered base with floor levelers. The matching set of accessories included a dial with applied brass Arabic numerals, a moving moon disk and ornate cast center and corner spandrels. The pendulum bob has a matching cast center disk and the weight shells have a matching band. 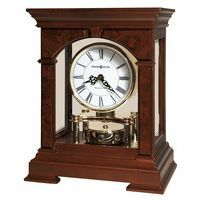 The mechanical 8 day cable driven movement offers the three most renowned clock melodies, Westminster, St. Michael and Whittington, second hand feature and automatic night shut-off.